While visiting Istanbul for performing live at Chill-Out Festival 2014 with Brandt Brauer Frick and DJing later at MiniMüzikhol Istanbul, EDHID had the chance for an insightful interview with Jan Brauer. We spoke with Brauer about early musical influences, dancing at Offenbach’s dance institution per se Robert Johnson, the enthusiasm about performing live as an ensemble, collaboration with Grammy award winners and airport towers. Enjoy it as we did. Hi Jan. You blog about airport towers. 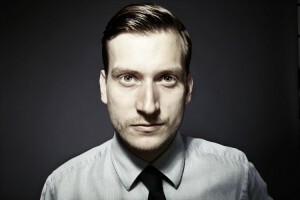 You also recently toured Central and South America with Brandt Brauer Frick. What about towers in Latin America? Yes, I just had vacation on the Aegean shores and I tried to take some pictures of the tower in Dalaman. Although it is not a military airport, the local police did not allow me to photograph at first, somehow I convinced them after showing my “collection” on the phone, though (laughter). Well, I have to admit that I did not update the blog for a while because we flew to recurring destinations but I would say that Latin American towers are rather unspectacular with just being integrated into the terminal. The Chinese towers, however, are tall and kind of nasty. Do you have a recommendation for Istanbul’s third airport? Yes, they may invite me for some guidance (laughter). You and Daniel are school friends and produced already electronic-influenced Jazz under the alias “Scott”. What motivated you to start producing music? The musical scene in Wiesbaden was really small. We frequently danced at the local club Schlachthof with regular Soul and Funk nights. The same DJs played the same music in the same order but it was always fun. The real musical revolution for us was with discovering Offenbach’s Robert Johnson at the age of 18. I still remember when I entered the club for the first time and it completely blew me away. We drove full of curiosity to Robert Johnson and we initially wondered when it was completely empty at midnight. Then it filled up and it was an intense experience to listen to performances of artists like Louie Austin and many others in the club. Actually it was the only club for pleasing our musical needs, at least until the massive hype resulted in incredible long queues and in a change of the crowd. They managed it after a while, however, by not publishing the line-up and we started again to go there. Where did you actually start to produce music? Daniel had already at that time a sound-insulated garage as an exercise room for his drums. After a certain period we converted it gradually to our production studio. You both met Paul via MySpace, right? Actually, a Portuguese guy based in Barcelona contacted us via MySpace and introduced us to each other. He wanted to book us for a party and launch a label as well. I remember that Daniel showed me Paul’s two MySpace profiles, one as Paul Frick with House productions and another as Paul Friedrich Frick at which he exposed new compositions (laughter). Paul’s diversity was, however, super interesting for us as we also did not like to constrain ourselves to a specific genre with having a broad area of interest as Soul, Funk, Jazz or contemporary music. How did you start to produce together? We always invited interesting musicians to Daniel’s garage for making music together. Hence, Paul was not the first but the vibe with Paul was extraordinary and the energy we felt was so unique that after four days we had already four completely finished tracks. We knew immediately that this was special and that we want to continue producing music together. Brandt Brauer Frick was founded in 2008. Why did you decide to focus on live performances? It was not related to a movement or the like, it was just our natural approach as musicians to have an immediate impact on the music produced. Frequently, your first shot is often the best. Hence, Ableton Live facilitated significantly with its infinite recording sessions that we have been able to record our improvisations irrespective of time lines compared to Cubase. Furthermore, the flexibility and enormous potential of AKG’s C-414 standard microphone impressed us so much that we focused on acoustic sounds and recorded everything we thought that might be useful for our music. Finally, we just enjoy every minute of performing live together. It’s so much more fun than staring into the monitor. Paul Frick once said that people like Theo Parrish inspired you much more than European avant-garde. What inspires you? Well, we are club kids and we have been always rooted in club music. Honestly speaking, inspirations do not come while listening to new compositions, they are rather caused by emotions on the dance floor. This does not mean that we limit ourselves to a 4/4 beat. Artists diverse as Theo Parrish, Herbie Hancock or 4Hero influenced us heavily and we all three like every bit of their music. Based on our background, however, we tried to incorporate these influences and process them in a completely new way. You are live band playing Techno with classical instruments. How do you think that this kind of music suits to seated venue? Indeed, almost every permutation occurred already from having people climbing up the stage and dancing around us to playing with ensemble at a Techno rave festival where you have to play against the massive bass lines next to your stage. It is the duty of the promoter to incorporate different factors as overall line-up, venue and stage size, playtime and order etc. Some promoters are really good in programming, however, not all of them. Your debut EP “Iron Man” was released at Danish label Tartelet Records. When did you decide to compile an album? At that time we just thought about releasing music and Ricardo (editor’s note: Ricardo Villalobos) should play it. Tartelet Records signed the four tracks from our first session immediately and it was actually the idea of them that our sounds would be perfect for an album as well. We liked the idea and started to work on a long player. Paul came to Wiesbaden every four to five months for having some studio sessions. Well, there was nothing else to do in Wiesbaden, so we spent four days in Daniel’s garage and closed the week with dancing at Robert Johnson. After a while, we had sufficient material for the album and elaborated also the live performance. In 2010, your debut album “You Make Me Real” was released on Berlin-based !K7 Records. Why not on Tartelet? We had the album finished and mixed by Rashad Becker so it was ready for mastering. After a while, the Tartelet crew has been so frank to say, however, that the album deserves comprehensive promotion and an established label might have the required resources to invest. Well, we did not want to release the long player for just having an album out. Retrospectively, we have been lucky with !K7 Records and its extensive network. How did the connection with !K7 Records emerged? Paul called them few times until he had the person in-charge on the line. At that time, the video of “Bop” was already out and quite viral. The video impressed !K7 Records and just after one week they signed us in. Why did you decide to ditch the computers and to form a 10-piece ensemble in 2011? Each of us played already triple roles at the “Bop” video thus hinting that we could extend our musical versatility with having an ensemble. !K7 Records liked the idea so we elaborated it further. How did you fill the respective positions? Paul studied classical music in Berlin and is also connected to the local scene. However, the set-up as an ensemble requires a lot more resources and planning activity. Compared to a planning period of three to six month in the club or festival context, you have to project one year in the classical music world. Hence, we had to fill every of the seven positions two to four times to ensure the availability of the ensemble. This does not mean, however, that we just invite different people to play for us, it is rather fun for them as well to play a groove and to have people screaming and dancing in contrast to classical music concerts. Over the years a real band feeling has been established. Is corporate sponsoring quintessential for the ensemble? Well, the ensemble requires a lot of logistics and we try to pay every member adequately. Corporate sponsoring definitively provides us more financial flexibility to realise our musical vision with the ensemble. It’s obvious that we could just perform on stage with a laptop. However, we believe in the musical value added of every piece of the ensemble. Your second album, “Mr. Machine” included reinterpretation of five tracks from “You Make Me Real”, two cover versions and one new track. It’s also completely unplugged except the Moog synthesizer. What was the idea behind the album and why did you actually choose to play the Moog? The moog is just another instrument of the ensemble. I learned keyboard so playing the synthesizer was somehow obvious. Furthermore, playing the deep, pushing bass line with the Moog is just fun. The sound of the Moog is so deep that you think the bass is coming from the next door. The combination of Moog and Tuba is even more powerful and I assume we were the first who played these together. Finally, “Mr. Machine” leverages the full force of the ensemble enabling us to shed light on these tracks from different perspectives. Released in March 2013, your third album “Miami” sounds musically enriched and is packed with songs featuring guest appearances by Om’Mas Keith, Erika Janunger, Jamie Lidell, Nina Kraviz and Gudrun Gut. What influenced the evolution of your sound? After the first two albums, we were kind of stigmatised as “Classic Techno”. This simplified description may have benefitted our popularity but we were just fed up with such a limitation. Our music was not about having an orchestra performing the strings of a previous hit track and renowned DJs like Jeff Mills or Carl Craig just kicking in the bass line. This is rather crossover and has nothing appealing compared to genuine piece of music. Essentially, the music we wrote for the ensemble would not exist without the 10-piece instruments, i.e. they are mutually dependent. Furthermore, 2011 was also a year of change for us. We were exhausted by playing hundreds of gigs over the last years, Daniel and I moved to Berlin and some of our friends thought, even though completely fictitious, that we had our heads in the clouds. Hence, we took a break for two months first and decided later that we want to continue with making music together in our new studio in Berlin. We were deeply rooted in club music, but we wanted to include also more musical volume in our productions than just having instrumentals. Retrospectively, I think it was exactly the right decision to reflect our experiences and musical development over the years in our productions. How did you choose the singers of the album, i.e. House and Techno DJane Nina Kraviz? Daniel and Nina both attended Red Bull Music Academy 2006 in Melbourne, so they knew each other from that time. I booked her also for my parties in Mainz back then and appreciated always her distinctive musical taste. Simple said, she is really into House and Techno (laughter). How did the collaboration with Grammy-awarded Om’Mas Keith emerge? I read that you sent him some initial ideas and received a complete song after few months? We became aware of him from a liner note of a song that we really liked. Indeed, we just sent him our first ideas around three and half minutes and thought that we can continue from there. We did not hear something from him for a while but he surprised us the more so with maintaining completely our initial structure and added some synths, claps and his soulful voice. We asked him also if he want to join us touring 10,000km with the bus around Europe without knowing that he won the Grammy at that time. After we found out his win of a Grammy, we were not sure if he sticks to touring with us until the very end. Well, I assume our music just blew him away somehow. After few shows as warm-up in the beginning of the tour, our music go well together and his jazz and hip-hop influenced contribution was a very special musical enrichment. Your DJ-Kicks compilation of Brandt Brauer Frick came out on 24 February 2014. You are not new to DJing, right? Daniel was already DJing with 17 and gave me always his mixtapes. He knew constantly in vogue sounds and introduced me to stuff like fabric Mix-CDs etc. When I moved from Wiesbaden to Mainz, I was also bored after a short time so I started to organise my own regular parties with some friends in a local club. Even though performing live is a lot of fun, it is also related to a high cost structure with a 10-piece ensemble, logistics and even a sound engineer. Hence, we started to DJ again and had our regular party Brandt Brauer Frick Club Night at Berlin’s Horst Krzbrg. Unfortunately the club closed, so we play more other cities now with rather selective dates in Berlin. How is it to play two-hour-sets with three of you? Well, in the beginning it was terrible (laughter). Playing just a tiny slot makes it really hard to build an arc of suspense. Everyone can only play few records, so you rather select your favourite banging tracks than taking care of the structure. However, we worked it out now and had already some great parties like recently at London’s “ÜberMax” with a broad variety in music. Nevertheless, I am really looking forward to play MiniMüzikhol alone tonight, though (laughter). How are your impressions from Istanbul? I love Istanbul. We played here one of our last stops of the “Miami” tour last year at IKSV. Chill-out Festival was also cool and I really liked the location with its diverse stages. We will play live as trio and ensemble this summer. During the “Miami” tour last year, we came up with a track together with Om’Mas Keith in Wiesbaden and Vic Mensa contributed later the vocals which will be released on the upcoming volume of Modeselektor’s Modeselektion series. We also plan to start working on a new album later this year but this is still kind of blurry.